Christmas card,will be reordered, & personalized in fall. I always buy my Christmas cards from Miles Kimball. The quality is excellent and I always receive compliments on them. These cards are absolutely beautiful, better than I expected. The extra matching round seals for the envelope were very pretty too and personalization looked great! This card tells the true meaning of Christmas, which we sometimes forget in the hustle and bustle. Everything was fine with the card. I would buy these from them again. Miles Kimball is our go to place for unique wonderful Christmas cards. We have bought our cards and many other things from them for many years. We have alway been pleased with the quality of their merchandise. I have purchased Christmas cards here for over 30 years! Every year I receive compliments on the beautiful Christmas cards we send. I have bought my cards from Miles Kimball for over 30 years! I bought these for my Mother. She was so surprised. She loved them and they were reflective of the reason for the season - the Nativity scene! These cards convey the Christmas message in a nice way. Will be very good for sending to family & friends this coming Christmas season. Very happy that I found them. These cards were very nice we send and get cards at church helps the Lottie Moon offering they are delivered in the church and we give stamp money these cards were just perfect for this ministry. I really like cards that tell about the birth. The cards were very lovely and I like the wording and the designs. I ordered a Christmas Card from Miles Kimball that was out of stock. They Agent suggested these as a replacement and they were perfect. Just beautiful and the service was excellent. Thanks.. I have been using your cards for about 12 years now and have never been dissatisfied. I don't even think of going elsewhere. Your cards have beauty, charm and warmth that no others can claim. This particular card has both a religious aspect which I must have but also the traditional Christmas look which I like. Keep up the good work. A pleasure to be able to send to friends and loved ones. No I would not buy this product again. ?? Beautiful Christmas cards! Love the picture and verse. What I don't like is that they come unfolded. You have to fold them yourself and try as hard as I can, they do not fold evenly. Can not be used. I wish they had said in the description that they were unfolded. I wouldn't have purchased them. They were not cheap. These are beautiful cards but they came unfolded and were impossible to fold evenly. I wish they had said that in the description. I would have bought another kind. Ordered cards weeks before Christmas only to have them arrive on Dec. 28, not the 5-7 business days suggested. Calls and emails to customer service were relegated to the blame gain. Will not use them again. The words and pictures are perfect. Wanted a card that showed the true meaning of Christmas this year. Have been using this company for many years and am always happy with their cards! I chose this card because it depicts the true meaning of Christmas. I thought the Nativity scene and the inside message would be a great inspiration for our congregation. I liked what the card says. It is symbolic of the true meaning of Christmas. I like religious cards and this card would be perfect for Advent or Christmas. The work is beautiful. I loved the nativity scene! Beautiful! The reflection of the nativity scene is very attractive. Last years and it was pretty neat. Absolutely a beautiful card with religious and christmas look to it a glance. It is important to remember that the real reason for celebrating Christmas is the birth of Jesus. I like the cards that I send out to reflect this. I chose this item because of the warmth the colors present as well as the message presented. We like to keep Christ in Christmas, and have our name on the card, too! Enjoyed this unique way to send a religious greeting for Christmas. It's the advent wreath AND the nativity in one! I like to choose cards with nativity scenes for my Christmas Card. I always like to send a Christmas card with the Christmas message about Jesus birth. Miles Kimball has always provided a beautiful card at a reasonable price. 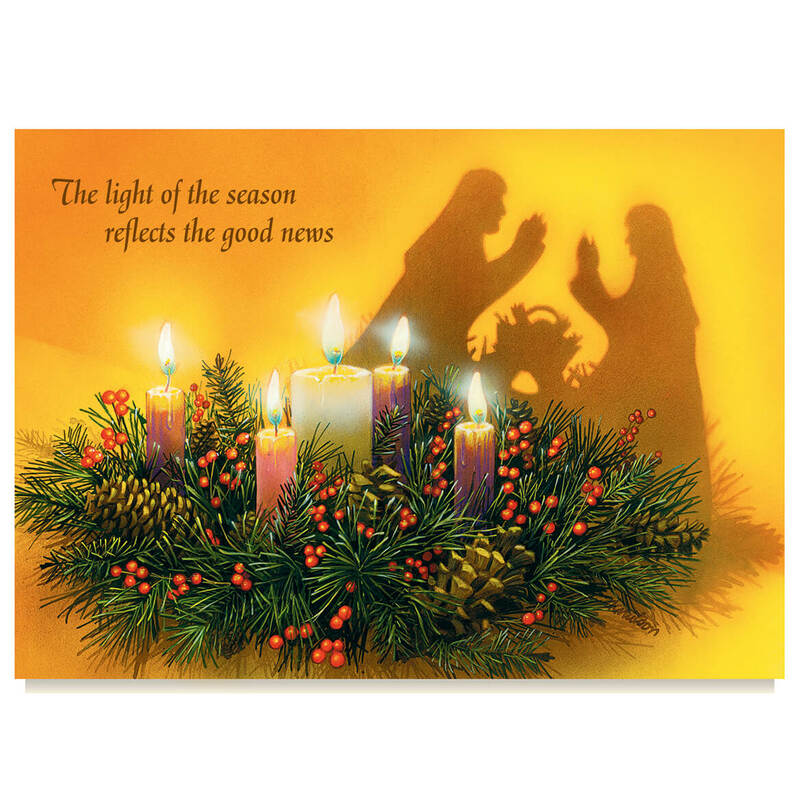 It is a beautiful card and tells the reason for the season very clearly. " Let us all reflect on the reason for the season...". Same as the above order. This is the 3rd year I have ordered these same cards. I got many compliments each year I have sent them. They deliver the message of the true meaning of Christmas. Excellent quality. Reasonably priced personalized Christmas cards! It makes people think about the true meaning of Christmas. where can I write the personalization ??? BEST ANSWER: The entire top half of the open card is blank, providing ample space to write a personal note or attach a family photo. This was one of my favorite cards from Miles Kimball. I hope this is helpful. A brief message can be written under the names or write on the back of the card. i write notes on separate sheets and enclose with my cards. I have to start early because I send so many cards. Just below the greeting inside the card. I love the way you personalize my cards. Inside below the greeting. 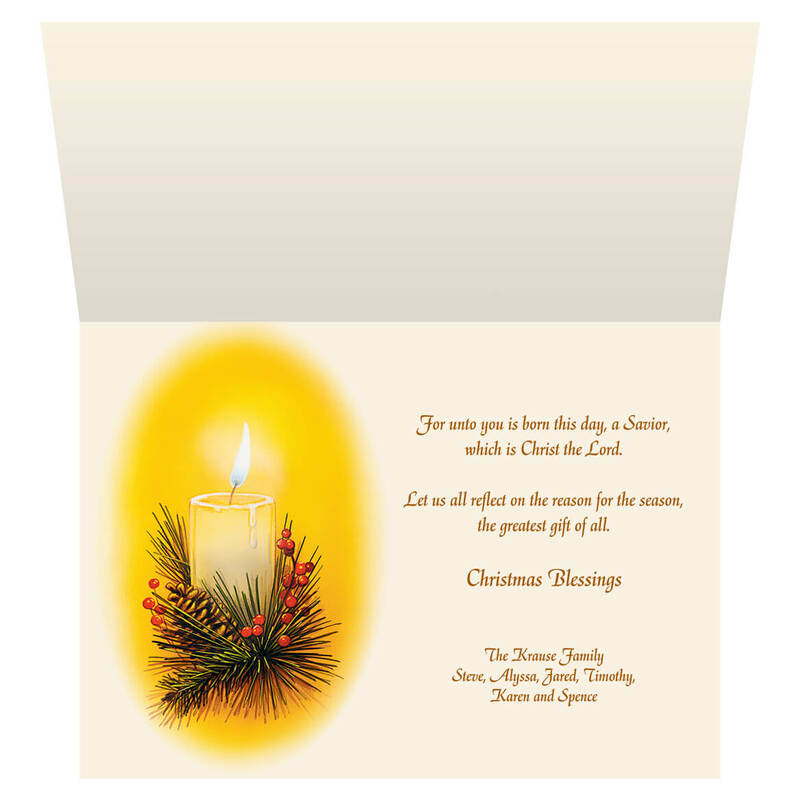 Add personalization on the inside of the card under "Christmas Blessings". What is the actual size of the mailing envelope? I'm just wondering to what measurements I need to fold my enclosed Christmas letter. BEST ANSWER: Thank you for your question. You would need to fold any insert to be 5" x 7" or smaller. We hope this information will be of help to you. Do you put the return address on the envelopes? BEST ANSWER: Thank you for your question. 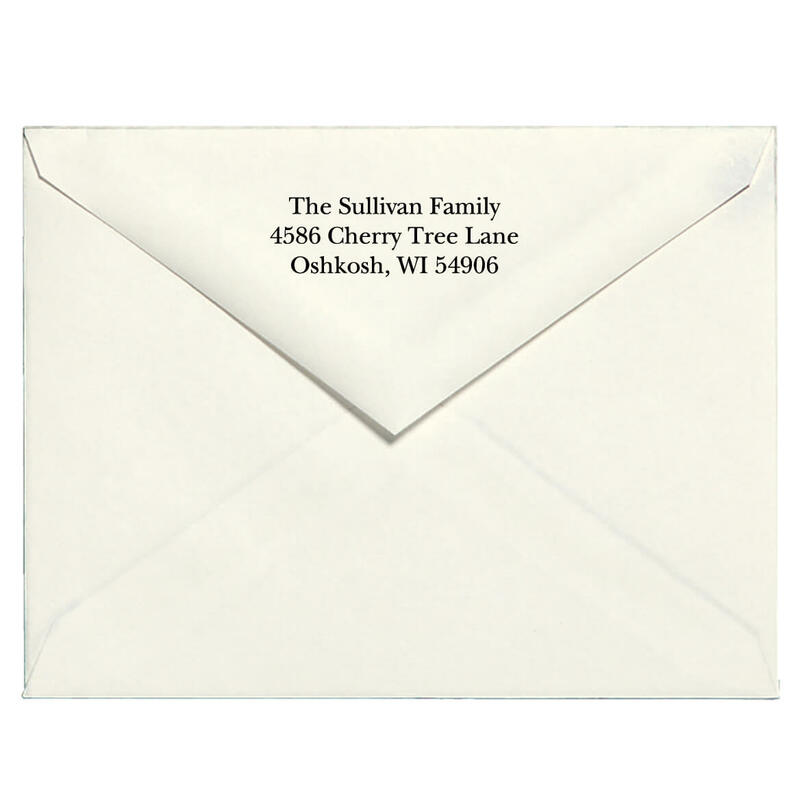 Yes, we do offer the option to have the envelopes personalized as well as the inside of the cards. This is not mandatory, the customer may choose what they would like to have personalized. We hope this information will be of help to you. Thanks so much. I'll have to phone in the order; my address has changed rather drastically and we will only be here a year or so, so I don't want to get a lot of stickers with the address, so having it on the envelopes would be a big help. I will phone you in a few days. I love your cards.